# DIXPFB8 - Female Pipe Thread - Brass - 1/2 in. Dual Lock Air couplings are designed for use with pneumatic air tools. Spring loaded interlocking engagement. Full opening permits full-line pressure to tool. 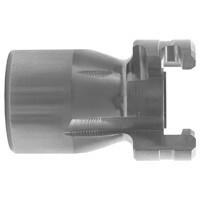 Optional locking key prevents sleeve retraction. 300 PSI working pressure. Interchanges with National "A" type, Perfecting "P" type and Thor PHC series couplings. PM and PF series must be used with mating Locking Sleeve fittings. Zinc coated.